Fluffy and delicious. 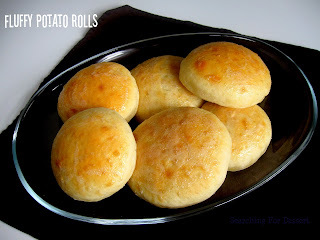 Those are two words that come to mind when thinking about these rolls. If you have an excess of potatoes in your house (on sale anyone?) or you don't, these are a nice change of pace. They have a very light flavor and are wonderful when they are warm. I'm pretty sure you all know that I love bread, love. bread. One of my favorite past times is when my husband and I just make some sort of bread on a random weeknight then sit and eat it hot out of the oven. Of course, it's not really a past time because we do it probably every other week. :) You should try it too! Bread is one of those things that can be made in so many different ways that I could make a different type of bread everyday for a long long time. At one place where I used to work I made naan for parties and at first I was apprehensive because I had never made it before but it was really really good. Yeah, that was terrible short story that went nowhere. Ask my husband, I'm known for those :). So, I actually still have a few of these hanging around the house and so we are planning to make French Toast with them. I will let you know how it goes but I'm pretty sure it's going to be delicious! 2. Mix together the warm milk and water in a bowl. Add sugar and sprinkle yeast on top. Set aside for 5 minutes. 3. Sift bread flour and salt into a large bowl. Using your hands mix butter and mashed potato into flour. Pour yeast mixture into flour and mix with a wooden spoon. 4. Place dough onto a lightly floured surface and knead for 8 - 10 minutes (or in a mixer with a dough hook for about 4 minutes). Dough should become smooth. 5. Place dough into a greased bowl and cover with cling wrap (or a kitchen towel) until double in size. Punch dough down. 6. 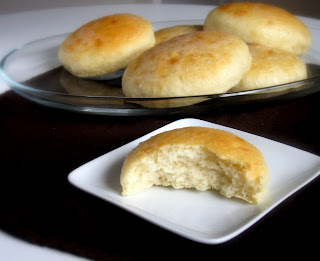 Divide the dough into 12 equal portions and shape into rolls. Cover and leave in a warm place until dough is almost doubled in size. (I put 6 per sheet pan). 7. Bake about 14 minutes or until golden brown. Brush with butter right out of the oven, if desired.